A volvelle from a sixteenth century edition of Sacrobosco's De Sphaera in the Whipple Collection. Sacrobosco's De sphaera, Algorismus and Compotus were extraordinarily successful, particularly as university text-books. There are hundreds of extant manuscript copies of De sphaera, and the work was first printed in 1472 at Ferrara. There were more than thirty further incunabula editions, and over two hundred in the sixteenth century; the last early-modern edition was printed at Antwerp in 1673. In addition, commentaries on the text range from those of Sacrobosco's near-contemporaries, such as Robertus Anglicus, writing in 1271, to printed works by Erasmus Oswald Schreckenfuchs (Basle, 1569) and Christoph Clavius (Rome, 1570 & 1575, 1581, 1585, 1606 etc.). The latter work ran to over 800 pages in its later editions, a huge increase on the 9 000 words of the original text. 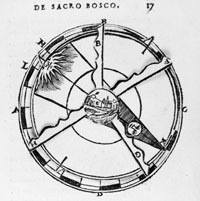 The work was also frequently supplemented in other ways, as for example in the provision of volvelles or additional diagrams to illustrate celestial phenomena. Extant manuscripts of the Algorismus probably number more than fifty. The work was printed in 1488 at Strasbourg, and in numerous subsequent editions up until 1582. The Compotus was not printed until 1531, but went through at least 35 editions between 1531 and 1673. It benefitted from being promoted as a university text by the Wittenberg pedagogue and reformer Philipp Melanchthon. This page is Copyright 1999, Adam Mosley and the Department of History and Philosophy of Science of the University of Cambridge. All Rights Reserved.